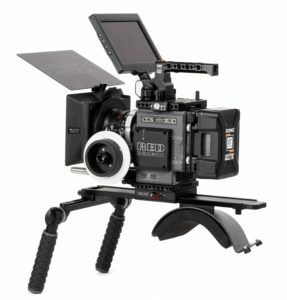 WOODEN CAMERA has announced the Shoulder Rig v3, an update to Wooden Camera’s popular Shoulder Rig. The Shoulder Rig v3 weight has been reduced by 10% for the Pro and 18% for the Base compared to Shoulder Rig v2 and the shoulder pad is now larger and more durable with an integrated kickstand for setting the rig down. The Pro version additionally features arms that telescope from 4.5 in (11.5cm) to 6.7 inches (17cm) and rotation points to widen or narrow grip spacing. Both the Base and Pro models of the Shoulder Rig v3 retain features from the former model including an ARRI standard dovetail and rosettes, a NATO standard crossbar for lateral left and right adjustments, as well as threaded holes for attaching accessories like monitors, rod clamps, cheeseplates, battery mounts, and a choice of black rubber or brown leather handgrip options.